We provide professional services at a fair price. We will deliver the service that you demand and deserve. 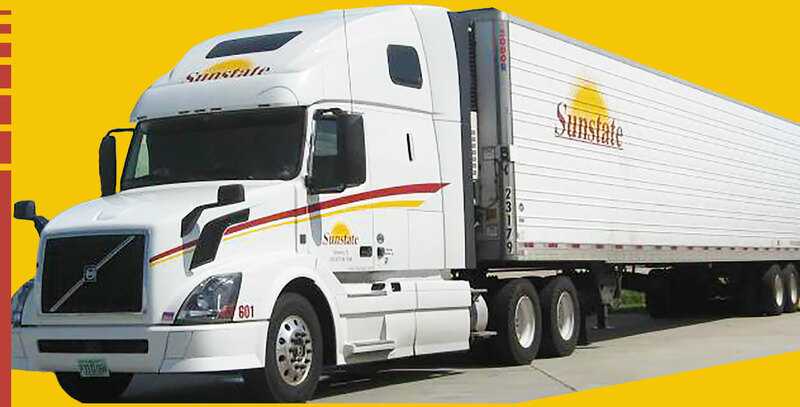 Sunstate is looking to hire experience over-the-road drivers who are drug free, dependable, willing to work and professional. From the beginning, Sunstate’s goal was to build an organization that is sensitive to our customer’s needs, providing professional services and at a fair price. Specializing in the efficient and safe transportation of temperature-controlled, time-sensitive products, we have become the leading choice of Customers seeking quality, customer-focused transportation services. While we continue to focus on our number one objective; to deliver on-time and damage-free, each and every time, we utilize new technologies to enhance our position as the industry leader in the safe and cost-efficient transportation provider of temperature and time sensitive goods. Improving our efficiency, productivity and communications in no longer an option the industry today. Our satellite based communication and tracking system allows us to maintain continuous communication from initial tender to the final delivery of our customer’s goods. This technology directly benefits our customers by making load status updates available throughout the shipping process.